This is an older post but it reminds me of my mom so I decided to re-post it for Mother’s Day. We lost my mom in 1998 but I think of her every day, especially when I’m in the kitchen! What Makes These Dark Chocolate Muffins Special? Beets Me. To tell you the truth, I’ve never liked beets. I was forced to eat them as a kid, I thought they tasted like dirt, end of story. Fast forward 25 years and I decided it was time to give the strange-looking red root another chance. My aunt and uncle recently took me to the local farmer’s market and one of the many things we bought were beets. It seems like I’ve been doing more baking than cooking lately so rather than post a recipe this time, I’d like to show off one of my latest baking successes. I purchased a sourdough starter from King Arthur Flour quite a while ago and I’ve been maintaining it despite the fact that I took quite a long a break from baking with it. Sourdough is finicky sometimes (especially when you’re new to baking with it) and I became a little disheartened after my last attempt. Everything had been going well and I had turned out quite a few great loaves of sourdough so it was frustrating when I saw two days of work collapse into an unmanageable pile of goo after I accidentally let it proof too long after shaping. That was actually my second sourdough disaster. So, I decided I needed a little break from it. Fortunately, the break didn’t last too long because I started craving the stuff! If you are new to baking and cooking with whole grains, I think one of the best places to start is with quick breads and muffins. I have already posted a recipe for whole-wheat banana bread and well, I guess I’m not very creative because here I go again with another whole-wheat banana recipe! I have been working this last week on creating a muffin recipe that tastes great but has fewer calories and more fiber than the muffins I’ve made in the past. Since I love banana bread and I always have some extra-ripe bananas stored in the freezer, I have mostly been working on a banana muffin recipe. I guess I went a little crazy the last time I bought frozen berries because when I looked in the freezer yesterday, I still had half a bag of blueberries. And this is after making the Blueberry Pancakes and the Blueberry Breakfast Bars! Not only that, I have 2 bags of frozen raspberries! I guess I’d better start looking for some good raspberry recipes. As you might have guessed from the pancakes I made, I love blueberries! One of my favorite ways to eat fresh blueberries is with cottage cheese but I also love them in yogurt or on cereal. And of course in desserts…especially blueberry pie! I don’t find a lot of fresh blueberries here but I have found that frozen ones work just as well in most recipes. I found this recipe on a great blog called Farmgirl Fare. It combines two of my favorite things…oatmeal cookies and blueberries! These are called breakfast bars but if you don’t like sweets for breakfast, these make a great dessert…especially served with some vanilla ice cream! As farmgirl points out at the end of her recipe, blueberries are really good for you! So if you’re gonna splurge and eat dessert, why not make it one that at least offers some health benefits? In fact, this dessert is twice as good for you because it’s also filled with oats, another one of the world’s healthiest foods! I know, I know, the blueberries and oats don’t make all the calories from the butter and sugar disappear. But wouldn’t you feel better eating a homemade blueberry bar rather than some preservative-filled, prepackaged junk food? What’s better than eating fresh, sweet, peaches over the kitchen sink with juice dribbling down your chin? Maybe nothing. Or maybe, some peach cobbler fresh out of the oven served warm on top of your favorite vanilla ice cream. A couple of years ago, I discovered something simple that changed the way I cooked. Fresh grated nutmeg. Maybe I’m one of the few who hadn’t caught on to this simple trick but I’m putting the word out, just in case there are others who haven’t been converted! Not only does fresh grated nutmeg make a world of difference in your desserts (i.e. Peach Cobbler), it will turn your ordinary béchamel sauce into something unforgettable. Try it with spinach, egg dishes, French toast; you’ll see what I mean. With all the special gadgets dedicated to grating nutmeg, one might think that it was a difficult task! I’ve seen everything from “professional quality” microplane graters to cute, miniature graters to store in your spice cabinet. You can even find antique silver nutmeg graters. But I’ve found that I get by just fine by grating it on the side of my cheapo, very untrendy box grater (you know, the side that will rip the skin right off your knuckles, if you’re not careful!). It works just fine and you really don’t have to apply much pressure. Well all this talk about nutmeg really is leading us back to peach cobbler, I promise! I discovered that fresh grated nutmeg tastes wonderful with fresh peaches in my favorite dessert. You can use this recipe or you can stick with your old standby cobbler recipe but just try it once with a few dashes of fresh nutmeg and see if you’ll ever want it any other way! In a medium bowl, mix together peaches, sugar, flour, a couple dashes of fresh grated nutmeg, and salt (if using); set aside. In a separate bowl, mix flour, sugar, baking powder and salt. Add butter and cut in with pastry blender or rub butter into flour with fingertips until mixture resembles coarse crumbs. In a separate bowl, beat the egg and milk together. Add the egg mixture all at once to the flour mixture. Stir just until combined–don’t overmix! Pour peach mixture into a small baking dish (8”x8”x2”). Drop topping mixture by large spoonfuls over the top of the peaches. Bake for 30 minutes in a preheated 375 degree oven. Topping is done when golden brown and a toothpick inserted into the center comes out clean. Serve warm with ice cream and then eat the rest cold for breakfast! * The topping part of the above recipe comes from Better Homes and Gardens New Cook Book. Back to the bread! I have had a couple of (undocumented) unfortunate breadmaking experiences lately so today I decided to go back to basics and make some good sandwich bread. I started a sponge for some sourdough tomorrow and hopefully it will work out. Last week I had my first really bad experience with sourdough and had to throw the dough out but I’m determined to keep trying until I can reproduce the last good loaves I baked. 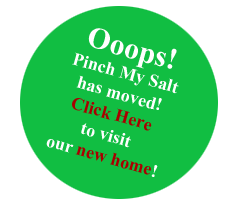 Pinch My Salt Has Moved!!! !